A few easy tricks make this spaghetti and meat sauce from scratch both simple and incredibly flavorful. Toss this meat sauce with your favorite pasta for a quick meal, or use it for other dishes such as Lasagna. 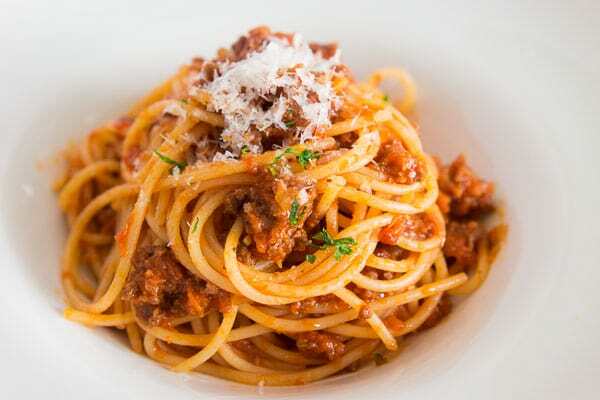 The secret to making a great spaghetti and meat sauce is to build layers of flavor (beyond the meat and tomatoes) and to allow them to meld together in a balanced way. As I’ve shown you in the past with my classic Ragù Alla Bolognese, this is a reasonably straightforward task when you include dozens of ingredients and simmer them together for hours. Doing this in minutes from less than a dozen ingredients presents a more significant challenge. By using a few flavor-enhancing time-saving techniques, this spaghetti sauce takes less than thirty minutes from start to finish without skimping on flavor. What you get is a well-balanced pasta sauce that’s neither too tart nor too sweet, with a complex savory flavor that belies the quick preparation. If you’re new to the kitchen, bookmark this page, because I’m going to show you some techniques that can be applied to almost any dish to speed it up while making it taste better. 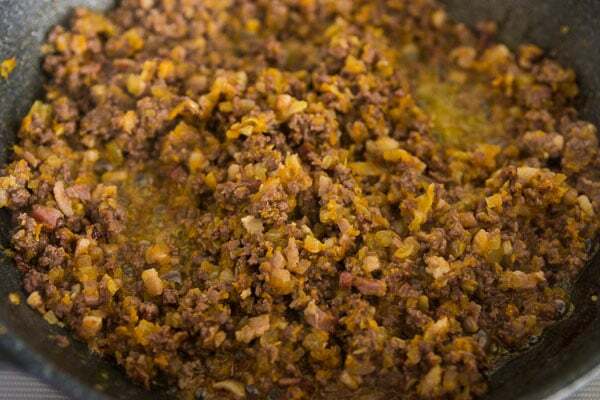 To create the meaty foundation for the sauce, I use two kinds of meat: bacon and beef. By browning them both, we take advantage of the Maillard reaction, creating new flavor compounds that give the dish depth. If you don’t eat pork, you can just increase the amount of ground beef by 100 grams, and then add a few salted anchovy fillets to make up for the flavor you lose by leaving out the bacon. The next layer of flavor comes from a mirepoix of onions, garlic, and carrots that you caramelize in the rendered fat from the meat. This not only brings out the natural sweetness of the aromatics, but it also creates a host of additional flavor compounds that make the sauce taste far more complicated than it is. 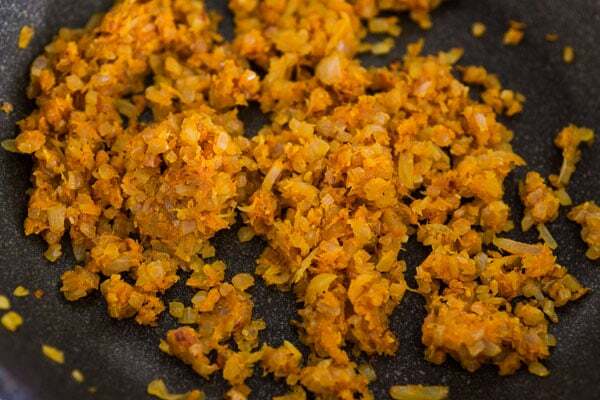 It’s important to chop the onions small and grate the carrot finely, as this not only speeds up the caramelization process, it hastens the release of the flavors into the sauce once you add the liquids. For the next layer of flavor, I added some white wine. The wine not only introduces fruit flavors, the liquid helps release the brown fond (caramelized meat and vegetable flavor) that forms on the bottom of the pan. By boiling the mixture until there’s almost no liquid remaining, you ensure that all the alcohol has evaporated, leaving a wonderful blend of meat, vegetable and fruit flavors behind. Since tomatoes used for canning are often picked before they’re fully ripe, they tend to lack the sweetness of fresh vine-ripened tomatoes. Adding a little ketchup to the sauce is a quick way to bolster the tomato flavor while balancing the acidity of the canned tomatoes with a hint of sweetness. Left to stew together while the pasta is boiling, you’ll have a delicious homemade spaghetti sauce in less time than it would have taken to order take-out. 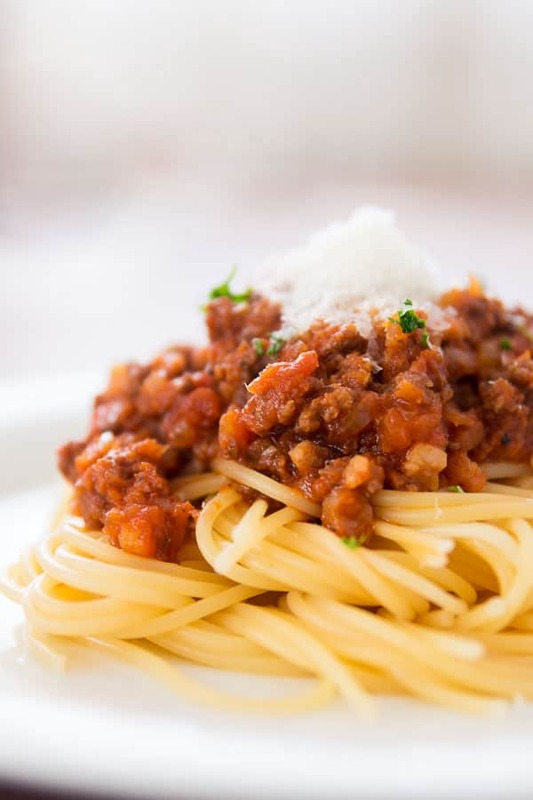 It’s not just about saving time though; with a sophisticated flavor profile that comes together in perfect harmony, this meat sauce will put most restaurant sauces to shame. If you enjoy this Spaghetti and Meatsauce recipe, go check out my Spaghetti and Meatballs recipe. They take a bit more time to make, but it’s the perfect weekend project for a Sunday supper. UPDATE: Here’s an awesome fan video by Big Stu who raps this recipe while showing you how it’s done. Put a large pot of salted water on the stove over high heat. If you taste the water after dissolving the salt it should taste pretty salty. This flavors the pasta. Whatever you do, do not add oil to the water. This is done to keep the noodles from sticking together while boiling, but it will also keep your pasta sauce form sticking to the noodles when you eat it. Add the bacon to a pan over medium high heat and fry until a good amount of fat has rendered out of the bacon. 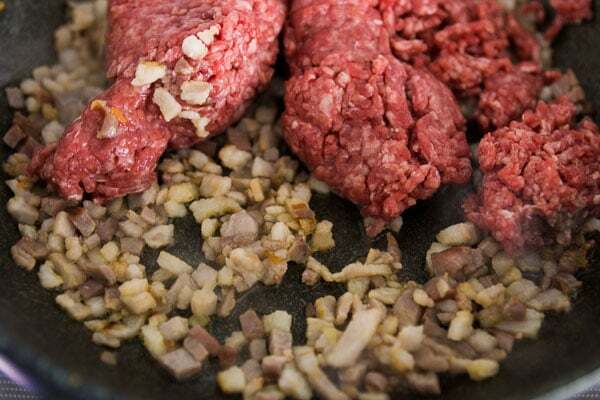 Add the ground beef and brown it, breaking up the meat with a spatula until it's cooked. Transfer the meat to a bowl, leaving as much of the fat as you can in the pan. Turn down the heat to medium low. You should have about a tablespoon of rendered fat in the pan, if you have significantly more or less, dump some out or add some olive oil. Add the onions, carrot and garlic, and sauté until the onions are soft and the mixture is about 1/3 of its original volume. Depending on how small you diced your onions, this should take anywhere from 10 to 15 minutes. This is where your sauce gets a lot of its flavor, so don't skimp on time. Turn up the heat to high, then return the meat to the pan. Add the white wine and boil until there's almost no liquid left, stirring to prevent burning. This not only burns off the alcohol, it concentrates the flavor of the wine. Turn down the heat to medium-low and add the canned tomatoes, ketchup, salt and pepper. Put the oregano in the palm of your hand, and then use your other hand to rub the oregano in a circular motion to crush it into a powder before adding it to the pan. Us a spatula to break up the tomatoes, being careful not squirt tomato juice on yourself. By now your water should be boiling. Add your pasta and stir during the first few minutes of cooking to keep it from sticking together. I usually boil pasta for 1 minute less than what the package directions say (i.e. 8 minutes instead of 9). Your meat sauce is done when your pasta is done. You can either plate the pasta and top with sauce, or personally I like to dump the pasta straight into the sauce and toss it together before serving. Hi Marc, I cook this a lot using similar method to yours. I usually use red wine instead of white? Is dat ok? Oregano do you use fresh or dried ones? I know this sounds odd, but I usually add a little fresh ginger to my mirepoix. Also, I sometimes add a bit of Ceylon cinnamon (true Ceylon cinnamon is more subtle and complex than the the cassia cinnamon most commonly available in the US). Both ginger and cinnamon go well with tomato. Marc, thank you for the 12 ingredient approach! What would you do for a non-beef version? Hubby won’t eat beef (or any critter on 4 legs), only fish, fowl, vegetables & fruit. I’m thinking minced chicken thighs, italian chicken sausage or turkey bacon & red wine? Hahahha love it! Send me an email (use the contact link above or “marc” at this websites, URL). Chicken thigh would be a fine substitute, but it’s not going to give the same meaty flavor. I’d suggest making some shiitake mushroom powder by grating dried shiitake mushrooms on a microplane and adding that alone with some italian anchovies. If you can get ahold of it, a black cardamom pod would also make a good addition as it has a smoky flavor. Personally I steer clear of turkey bacon because it’s so processed, but chicken sausage may be a good addition too. That sounds amazing Marc!! I make pasta every week, but I will try your version soon! Marc, I keep coming back to this one and I’m not even a huge pasta fan. The difference in YOUR blog (to many others I follow) is the background about WHY it works. I feel like I’m truly learning about cooking in a manner that will allow me (over time) to become a better cook. Thank you for the inspiration!! I have a similar question, which is that I don’t eat beef, but I’m fine with pork and chicken, so do you think that cooking this with minced pork and bacon would be too repetitive? be repetitive as bacon has a very different flavor profile from uncured unsmoked pork. Glad to hear it! Also love the idea of adding mushrooms. I often shave some dried porcini or shiitake mushrooms into the sauce with a microplane for an added boost of umami. I can’t use dry white wine because of some health issues. What will be the best substitute for it? Please help me ASAP! Thanks! If your issue is with alcohol, it will all burn off as it cooks. If you really want to avoid it just leave it out all together and go straight to the step 5 after returning the meat to the pan. I now make this weekly and then visited my parents who now also make this often. Also, the notion of deglazing the pan with wine has now become standard practice whenever I am experimenting with stuff in my kitchen. Thanks Marc….keep doing what you’re doing. I also LUUUUUUUV the Japanese Hamburger recipe…delicious. I’d like to know what will be the equivalent of a 400g can of diced tomatoes? As I’d like to use fresh tomatoes. This was not my favorite thing, but not terrible. I think I like my sauces a little more tomato-y so I ended up dropping in a little can of tomato sauce at the end, but I still think it was missing something. But it was easy enough to make after a day at work! How much of mushrooms are needed? them with the onion until there’s no liquid coming out of the mushrooms. Recipe looks great! Love the use of carrots. Can you recommend how to adjust the recipe to be used for a lasagna filling this weekend? Also, how can I make the recipe using tomato paste and brown sugar instead of ketchup? Thanks for the guidance! Really good!!! I made it, tastes really good. By the way I’m a ten-year-old. What can I substitute fresh tomatoes for the canned tomatoes? You can substitute fresh tomatoes, but unless your tomatoes are very ripe and sweet, chances are this will taste better with canned tomatoes. Also keep in mind that canned tomatoes are precooked and have had some of the liquid evaporated so you’re going to have to use more tomatoes than the recipe specifies and cook them for longer to get the same consistency. What can I substitute for the white wine? Not quite 21 years yet so no wine for me! 2014-03-02 16:19:00′, ‘Just made this — like 15 minutes ago — and the kids love it!! My daughter said I should make more and she’s my worst critic!